I feel like hell, the truth behind the hiatus.. I've been debating whether to post this or not, I don't want to sound whiney or like I'm looking for pity, and it's a lot of personal information but I figure you don't have to read it if you don't want to so here I go. For several months now I have slowly felt like I have no energy left, that in fact my cup is empty and I have no more to give. I have been struggling with an all time low when it comes to my energy level along with crippling pain for 2 weeks out of each month caused by my endometriosis (one week for ovulation and one week for my cycle). I have always treated my endometriosis with birth control to prevent me from having a cycle and in turn prevent the endometriosis from growing. After I had James the birth control was not stopping my cycle and I was experiencing pain from the build up of endometriosis. I decided to try a IUD, something my sister has had success with when treating her endometriosis. It didn't work. I have been unable to stop my cycle and there for unable to prevent the growth of endometriosis in my body. With each month it has started becoming noticeably worse. I have altered my diet and have continued to go to the gym a minimum of 3 times a week unless physically impossible. I was hoping that would help me at least with my energy level, but nothing has changed. If anything I am a little more tired from working out, even though I have gotten stronger and healthier I am still weak and tired. I have started to rely on caffeine and pain killers more than anything to get me through the day. In all of this I have felt guilty/bad for my children. They are good kids and deserve a healthy, active, and fun mom. I want to be that mom. Delilah will regularly ask me on bad days "Mom when are you going to have the doctor fix your tummy so you can play?" It breaks my heart every time she says it. 1. Get pregnant, the only known "cure" for endometriosis. 3. Have all my reproductive organs removed, the only permanent solution for endometriosis. I cried.. right there in his office. None of these were options for me, and he didn't care. He asked me what I had been taking for pain and when I told him ibuprofen he was surprised I wasn't taking narcotics and suggested it must be manageable if I'm only taking ibuprofen even when I told him it was up to 2400mg a day. How can I take narcotics when I'm a mother to two young children? He got up and left me there, crying. On the way home I made an appointment with my regular gynecologist for a second opinion, knowing she isn't a specialist it was a long shot, but I needed some hope and I was willing to take it in long shot form. The next week I met with her. I gave her my medical records and also told her what the specialist had told me. I came mentally strong and prepared for bad news. She was very kind and told me that she agreed with me and that those didn't seem like good options and in fact personally knows the specialist and was confused he would only offer those options to me. She referred me to another doctor and wished me the best. I called and tried to make an appointment. The specialist is part of a fertility clinic, when I called to make the appointment they told me she only works with women actively trying to get pregnant but since I was referred they would talk to her and see if she was willing to meet with me. The next day I found out she was and made my appointment to see her. I was so nervous when I went to see her I didn't have the strength to be strong anymore and my emotions were pretty close to the surface. After waiting in the waiting room for about 3 minutes, the doctor came out to take me to her office, (I've never had a doctor get me from the waiting room). She took me to her office where I told her what the past doctor had said and that those weren't options to me (my way of saying "this is what I've been told so lets not waste each others time with these stupid options.") She was quick to tell me she doesn't think pregnancy is an option especially when it isn't easy to get pregnant and we are trying to rid me of pain and trying to get pregnant could take a year or longer.. a year or longer of more built up endometriosis, more pain. She also told me she would never give me Lupron because of my depression it would worsen it drastically. She then said you are to young for a hysterectomy if you aren't 100% sure you are done having children. Then she said "I think we should do another surgery to clean everything out, if that is ok with you." She then told me she was looking at my medical records and my thyroid is messed up. She told me this with out me telling her I had been working out and dieting with no results. She explained that my thyroid is probably why I don't have energy and haven't lost weight. I wanted to hug this sweet woman. She gave me a prescription for my thyroid and even did all the pre-op stuff so as soon as I come home from Utah I will have a surgery. Half way through my pre-op exam I stopped her and told her I had to thank her. "Don't thank me yet, I've not done anything yet." "You have already done more than others, thank you". This year was suppose to be my year, the year where I become the person I want to be for the rest of my life. 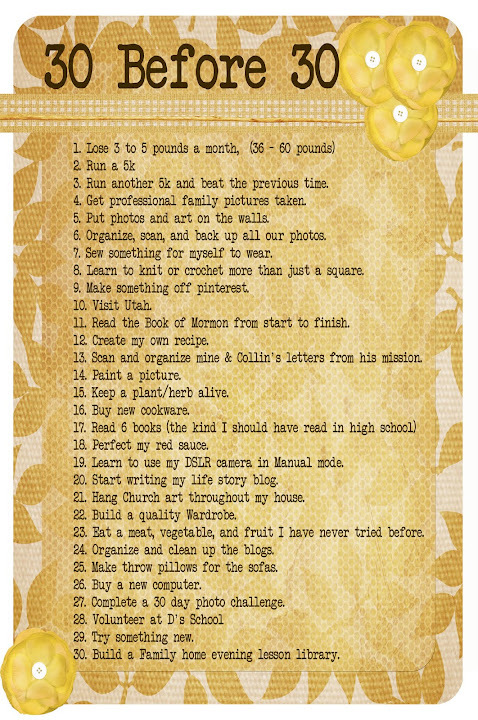 I have felt bad that I haven't been checking things off my 30 before 30 list like I have been wanting to. I feel bad my house hasn't got the attention it needs in regards to decorating and routine cleaning. I feel bad I haven't been able to cook and do other things I enjoy as much because I am laying on the couch or ground trying to survive or just plain lack the energy. I feel really bad I haven't been able to be the mom and wife I want to be. It has been difficult being the sick person on the couch unable to accomplish much of anything. After a while you start to question yourself wondering if it possibly is just all in my head and that if I were only mentally stronger I could be that person I really aspire to be. I'm ready to be healthy again, I'm sure my family is ready for me to be too. All that being said.. I promise I haven't disappeared or fallen into some deep depression. I've just been surviving. Hopefully by the end of September I'll feel like myself again and be able to hit my to do lists strong again and possibly blog a little more. Thanks for everyones support and concern.. I'm still here and can't wait for september. Wish me luck!! No one likes excuses but I feel I should give you one for my absence. Life has been... crazy. The best way to explain is through Cell phone pictures. Delilah was a busy kid, very busy, but she didn't climb or do dangerous things James I spend the majority of my day just keeping him alive. and making sure he doesn't kill his sister, this is what he pulled out of her hair when they were fighting over a pillow. Oh... and he doesn't let me sleep, note the dark circles. Know that even though I am absent here I am doing well and surviving. I haven't given up on my 30 before 30 goals and have in fact already done two races this year and go to the gym 4-5 times a week (gotta love childcare). I don't know when I will start blogging regularly again but for now as soon as the kids are in bed I'm spent. To those who check this blog normally sorry I've been absent, I've been in survival mode and it's taking me a while to get out of it. At the beginning of February both kids developed a ugly croup cough it sounded worse than it was. They never had a fever and it didn't seem to effect their mood, they just sounded terrible. After two weeks of coughing one day Delilah just stopped coughing the same day James got a fever and went downhill fast. We went to the doctor and long story short he was on a nebulizer at home for two weeks. Those very sad, very sick, very exhausting two weeks just happened to be the same two weeks Collin had to go to China for work. CHINA!! We are still in survival mode due to having our routine so messed up, James cutting molars, Collin trying to shake his jet lag and my exhaustion, but I think we are almost out of this crazy funk. Its even suppose to get into the 50's this week. Here's to life and surviving ... and wish me luck because Collin is leaving again. I've titled this month "These are a few of my daily things" James developed a bad respiratory infection so we stayed home watching TV and not doing much. Roku: This is an amazing little box that streams channels to your TV mainly use it for Netflix. I don't know how we lived without it, especially on days like today. Go UTES!! That fresh values card has worked at the kroger in SC and now the one here in MI, I will NEVER take it off my key chain. This is an old school baby monitor but for some reason it is AMAZING you can hear a pin drop in James room and I crank it right now so I can hear his breathing. I love holiday decorations. The last few years the only holiday we decorate for is Christmas, and I feel bad about it, because I know Delilah would LOVE it. One afternoon when James was sleeping D wanted to make Valentines (she wants to make Valentines year round). So I grabbed a bunch of scrapbook paper I wasn't to fond of and cut out a bunch of hearts for her. As she was gluing I thought "She better not glue them to the wall" then another thought ".... hey we should glue these to the wall." Delilah was in heaven as she was sticking them to the wall.. .. she was also singing Feliz Navidad. If I had of known they would be this cute I would have picked cuter paper. I tried to take one off and yes, it will be a disaster to remove them but nothing a little water and elbow grease won't take care of. For how much Delilah loved this simple decoration, I think I will try to do it more often. Lately I've been a little obsessed with D's hair. She lets me to do it everyday and doesn't complain to much as long as I'm quick and don't pull too hard. I love when the other moms at preschool tell me how cute it is and ask how I did it, or when strangers tell me how pretty it is (well sometimes the stranger thing is a little creepy). I know her hair a pretty color but I feel like I contribute to it's beauty by having it, lets say, "arranged" well. As beautiful as her hair is it does have it's tricky parts, and I call her lucky not because I'm amazing at hair but because I just happen to know how to take care of this specific kind of hair from my own personal experience. She has those beautiful ringlets, but the top layer of her hair is all straight, so I try to arrange it so the top is pulled back allowing her curl to show. 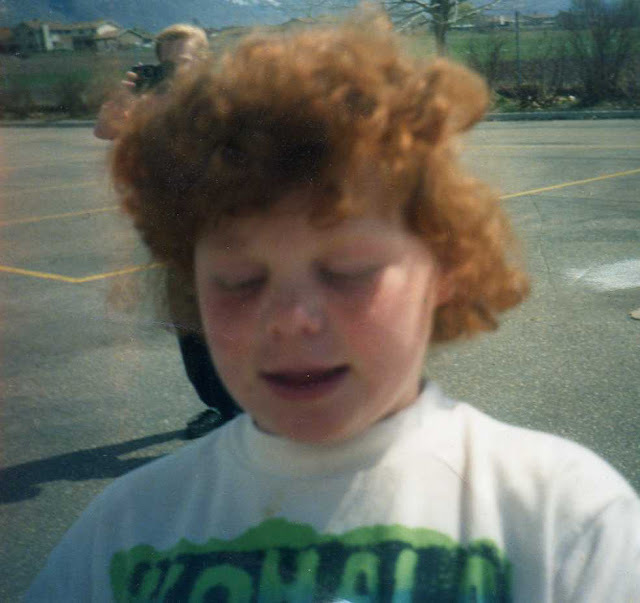 I always had to do the same thing when I would wear my hair curly for the same reason. Another thing we fight is frizz, luckily there are products out there that we can use to help control the frizz and I also know when to and when not to wash her hair, along with how to dry it to reduce frizz. I wish these products had been available to me when growing up.The reason I use the word "lucky" is because friends, I was not so lucky. I don't think I got as many "wow her hair is so pretty" comments and my sweet Delilah does. Does this mean that I am living vicariously through my daughter like those moms on toddlers and tiaras? I hope not because those women are crazy! Here we go, my first month down and I've started on several of my goals. I'm down 7 pounds. Not an amazing start, but I met my goal, and I'll take it. I wanted to take this slow and steady as to not get burned out and quit. Bleh... I made a few things off pinterest this month but ... I'll wait until I do a successful one. I am on my way to meeting this goal. I bought a pair of quality jeans and boots. Its a step!! This month I had a fun opportunity to read a book to Delilah's class. Reading and cutting shapes are the only volunteering her class is currently in need of, I signed up for both. I read one of Delilah's favorite books "Grumpy Gloria" to her class. It's a cute story about a bull dog who is grumpy because his little girl owner got a new doll and Gloria is jealous. It was fun, granted most the kids didn't know what it meant to be grumpy and Delilah did keep giving away the story. I remember my parents putting this on me to try to get me to stop sucking my thumb. I also remember powering through the disgusting taste and it not working, but I thought I would give it a try with D.
Well I've finally got to writing my 30 before 30 checklist. I'm excited about it, this is going to be my year. Since August of 2006 I have been trying to get pregnant, pregnant, or nursing, I think it's time for a little me time. I'm excited to finally have a dead line, some of theses things have been on my mental to do list for a LONG time. So here's to the last year in my 20's!! The plan is to post a monthly update on the 17th of each month.... here we go.